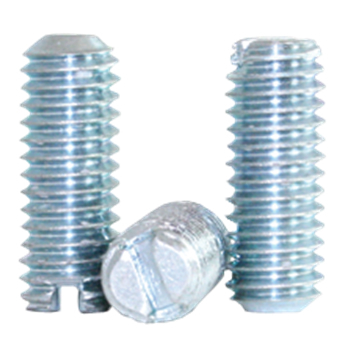 Slotted set screws are fully threaded headless screws with a slot on one end and a cup point on the other. The slotted drive on slotted set screws does have some advantages as ease of use since everyone has slotted screws drivers. Another advantage is they are easier to clean out debris than that of the hexagon drive. RC Fasteners & Components is currently stocking slotted set screws in case hardened alloy with a RoHS clear zinc coating along with 18-8 stainless steel material. If your looking for a specialty size or material not found in our online store, click the quick-quote button and we'll be happy to assist you.